No jets involved, nor is it a pack. 'Blower-throne'? A New Zealand company founded by a garage inventor says it is in talks to sell its so-called "Jetpack" - actually a personal ducted-fan aircraft too heavy to be lifted by its user - to the US military. Stupid background projection out of focus again. The New Zealand Herald reported at the weekend that inventor Glenn Martin, founder of the Christchurch-based Martin Aircraft Company, says his firm is in talks with the US Defense Department. "We're already dealing with Rockwell Collins. We've got conversations going with [Boeing, Raytheon and Rockwell Collins] and more, in particular those conversations are being led by the US Department of Defence," he told the paper. Martin invented his "Jetpack" in his garage, and has been working on it for decades. Weighing well over 250lb, it is in fact much too heavy to realistically be described as a "pack" - rather it is a small aircraft which you strap into, as opposed to strapping on. Nor does the Jetpack feature any jets, instead using a two-stroke engine to power two large ducted fans. A better name for it would be "blower-throne" or somesuch, though this would obviously forfeit a lot of marketing impact. 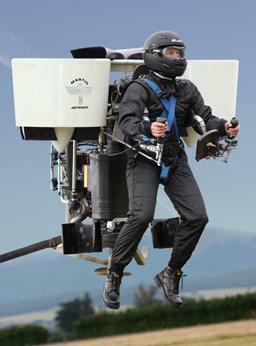 The Jetpack, despite not being a jet or a pack, shot to global fame during the terrible summer news drought of 2008 after a New York Times scribe had a hover about in it at a US airshow. Since then Martin and his colleagues have predictably struggled to stimulate any serious interest in their machine. The New Zealand government's Foundation for Research, Science and Technology has chipped in NZ$1m, and the firm says it has received $12m for manufacturing and distribution rights in an unnamed foreign nation. The company also claims that as many as 1,600 people have "expressed interest" in buying a Jetpack for $140,000 each. However the foreign rights sale last year was described as insufficient to actually get the Jetpack into manufacture by Martin Aircraft chief exec Richard Lauder, who stated at the time that the cash "will give us a lifeline but it doesn't give us the sort of venture capital we need". It's always possible that the US military might want the "Jetpack" for some reason, but it's hard to see why. There are already various working one-man aircraft which offer superior portability and would be just as good for most jobs - and the US military isn't interested in those, either. The Herald writeup reports suggestions by Martin and Lauder that an unmanned version might be on the cards, but again there are many proper, working VTOL UAVs already available. The credence of the supposed defence-department talks was also rather undermined by apparent differences of opinion between Martin and Lauder on the desirability of military sales, with Martin saying he would be "pretty pissed off" if his invention wound up being used to carry weapons.